3rd clean sheet in a row. 2 goals. One each from our new signings, and the look on the faces of Liverpool fans when the goals went in. There really aren’t some things Mastercard can buy, and we all witnessed that today. Arsenal named the same starting lineup that faced Stoke last weekend, the only change being Alex Oxlade-Chamberlain starting in place of the innefective duo of Gervinho and Theo Walcott. Liverpool handed a start to their new Turkish loan signing from Real Madrid, Nuri Sahin, who at one point, last month was so close to being an Arsenal player. Daniel Agger replaced Uruguyan Sebastien Coates at the back, after his one match suspension was completed. To be fair the opening few minutes were very sloppy from both sides. Possession was in neither hands for large periods of time. Lackluster is the word to describe the opening few minutes. Liverpool had the first shot when Borini shot well over from the right. Luis Suarez had moved centrally from the last game against Manchester City, and it was clear to see that Rodgers had asked him to specifically target the slow but steady Per Mertesacker. It seemed to be working as the German tugged at Suarez, and got himself a yellow card. Daniel Agger, totally unmarked should have scored with a header off a Gerrard corner. Arsenal ‘s midfield was looking impressive. Mikel Arteta, again put up in defensive midfield, was tidy and allowed enough freedom for Diaby and Cazorla to venture forward. The former’s close control was absolutely top notch today as he squirmed himself out of several situations, making full use of his ‘toothpick’ like legs. On 31 minutes, Steven Gerrard, lackadaisical all afternoon, lost the ball. Cazorla raced through the middle, in a swift counter, with Liverpool wide open. Giroud caught the attentions of Liverpool’s defenders, and Cazorla spotted Podolski winning his run with Johnson. A carefully weighted ball later, and Podolski had the ball onto his favorite left foot, and then into to the back of the net. There was palpable sense of relief on having seen Arsenal score, and it was delightful to see Podolski opening his Arsenal account. Liverpool, woken up by this, immediately had a chance of their own, when the impressive 17 year old Raheem Sterling hit the outside of the post with his shot. Moments later, Liverpool had a penalty shout turned down when Mertesacker seemed to have bought down the youngster. But, television replays clearly showed the German’s lanky legs came to full effect, as he had made contact with the ball first. Olivier Giroud, who was quiet so far, and happy at winning headers against the Liverpool defence, had his own chance to open his Arsenal account, but his shot was bad, and went wide. Arsenal were the happier side going into half-time. Arsenal started the second half with much composure, as Liverpool looked frustrated at not having any possession. 5 minutes into the half, though, Liverpool should have had a penalty when Mertescaker bough down Suarez, who was attempting to get to the end of a Gerrard cross. Referee Howard Webb must have perceived it as more of Suarez theatrics, and waved play on. Arsenal’s tightly knit defending was there for everyone to see, as Liverpool were forced to shoot from far. Stewart Downing, who had replaced Fabio Borini, played a delicious backheel to Suarez, but to no avail. Sterling, who was Liverpool’s best player on the afternoon, was creating more problems for the Gunner’s defence, but Vito Mannone had everything covered. Santi Cazorla had a shot on target moments later, but it went narrowly wide. He didn’t have to wait too long though, as he and Podolski combined again moments later, to score Arsenal’s second goal. Cazorla’s shot was fumbled over by Reina into the net, and the Spaniard jetted off to celebrate his first goal in Arsenal colors, leaving his former Villarreal teammate in distress. By then, Liverpool had already lost it in their minds. Suarez had a shot over, and Shelvey had a go from long range. Steven Gerrard escaped a booking for a crude challenge on his opposite number Thomas Vermaelen. Olivier Giroud should have got on to the scoresheet when he was left unmarked off a corner, but his header went over. So, 3 points and I can’t be any more pleased. Again, plenty of positives, none more so than the unflinching defence. Some amazing background work has been happening with it, and it was very evident. While Vermaelen had a couple of forays, the defence was very disciplined and stuck to their priorities. Kieran Gibbs and Carl Jenkinson both were at their best today. Don Vito Mannone looks like a good backup for Szczesny, and who knows, may be pushing the manager for a first team spot with calm displays like this. Gibbs, while going forward a couple of times, also made sure he didn’t leave any gaps at the back. Jenkinson had a tough battle against Sterling, and the Liverpool lad seemed to be winning his early battles. Jenkinson however stood his ground, for the rest of the game, and came out tops. Predominantly, Liverpool tried to shape their attacks from the left, to exploit the Jenkinson-Mertesacker likely weak spot, but they gradually had to shift more inwards. Abou Diaby was a revelation, and we all know Arsene will say he is a new signing. Well, he is not. He is just reborn. He bamboozled Liverpool, time and time again with some finely timed runs. 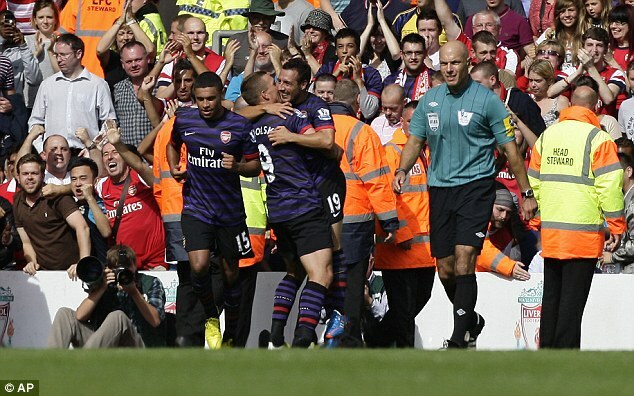 Cazorla again looked impressive, and Podolski worked his socks off, to help out defensively. Alex Olxade-Chamberlain was a bit anonymous, but he had to work a bit defensively as well. Arteta was polished and rarely put a foot wrong. While the commentators were talking about how good Joe Allen looked, they completely forgot about our Spaniard. According to some stats, he had 18 more passes than the Welshman, and with better passing accuracy. Giroud, seems to be getting into good positions, and he has the knack of doing that, but he has shown the tendency to miss. It’s all about confidence. Ian Wright, Thierry Henry, Dennis Bergkamp, and sigh, Brave Sir Robin all opened their accounts against Southampton. So, it is well set up then for the former Montpellier man. That’s in two weeks time, and it’s gonna be a hard and tedious two weeks without the Premier League.